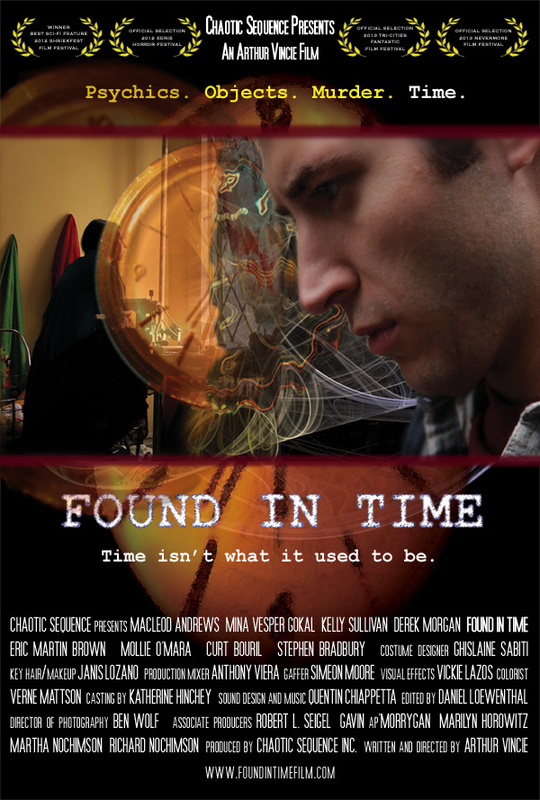 … there’s mostly a wealth of skill on display in Found In Time. Director/writer Arthur Vincie crafts a compelling story, balancing character-building dialogue and mind-bending mystery organically throughout a relatively contained environment. The cinematography from Ben Wolf is quite impressive considering obvious microbudget restraints, with the more sci-fi leaning scenes offering stellar visuals. And a special mention should go out to editor Daniel Loewenthal, as the film’s time-jumping narrative structure is quite dependent on his cohesive and careful work. Also commendable are the cast, each of whom handle the heady material effortlessly. MacLeod Andrews is rather exceptional as Chris, offering a unique spin on the perpetually uneasy protagonist with an infectious natural enthusiasm for the character and his world. Kelly Sullivan is equally as good as Jina, especially once her character takes a subversive turn in the latter half of the film. And Mina Vesper Gokal and Derek Morgan stand out among the supporting cast, with the former offering an element of attitude to what could have been a quirky narrative addition and the latter bringing some much needed humanity in the first half of the film. One of those small gems, which without seeming like much, do transport the viewer into their own crazy and delirious worlds. Probably the most ambitious time-travel film I’ve seen in terms of mixing up multiple layers of cause & effect, and I applaud Mr. Vincie for pushing the edge of the envelope… bring along your thinking cap. If you like intellectual science fiction, I would highly recommend seeking out this film. … it’s a smart film, and that’s always a plus. The acting is great, and the idea is, too. The cinematography is pitch perfect, and the acting was across the board spot on… filmed with an Aronofsky touch but had the feel of Christopher Nolan’s Memento… The writing was phenomenal and the story was as intriguing as they come… I recommend that people go and check out this film because it’ll have you thinking about it long after you’ve left the theatre. The emotional guts of it are top-notch. The hero of the movie is sweet. He’s a jerk. He’s a murderer. He’s all three. Most importantly, though, the the movie makes a concerted effort to sort itself out. Examiner: Two Must-See Films at the Gen Con Film Festival. Nerdvana: Phoenix 2013 Festival Day 3, includes a positive review. Geek News Network: Phoenix 2013 Festival Roundup, includes a positive review. Comedy Film Nerds: Shriekfest 2012 Festival Article, includes a nice capsule review of the film. TrulyDisturbing: Shriekfest 2012 Festival Overview Roundup, includes a very nice review. SlaughterFilm: 2012 Eerie Horror Fest Day 3 Roundup podcast, including a cool review. Download print-friendly 300DPI CMYK JPEGs. Adobe Acrobat required for presskit download.